Suffering is part of the job! Guru Sri Subramanium explains how suffering can be reduced by the grace of God and a Guru. But he explains how he must then wear our karma and suffering for a time. When you have a job to do and you are serving the highest embodiment of goodness you never think twice about any inconvenience that the body is put through. Yes, the body is put through a lot of pain. 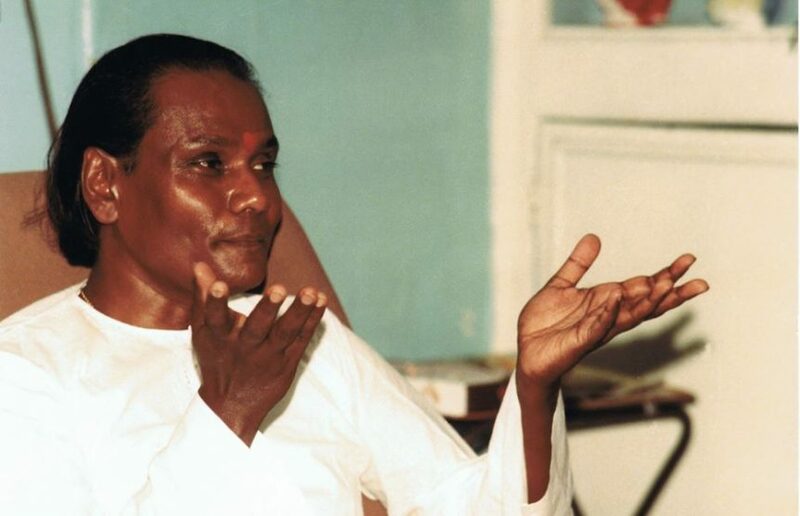 Let’s look back at some of the great teachers, masters and saints. Do you think that they suddenly sprouted wings and flew up to heaven? No. From Christ to every avatar, every master, they all have had to go through a lot of suffering to show the world the purpose of their birth and to fulfill the scriptures. When Christ was challenged in the garden of Gethsemane, by the Roman soldiers who came to arrest him, Christ’s disciples went forward to stop them, and even cut off one of the soldier’s ears. If any human being has undertaken a job to do on behalf of Almighty God, then they must fulfill that job. There are two people within you – your karma and your divinity. If your divinity has linked with Almighty God then you never think of yourself. Whatever anyone has said about Sai Baba, or any other saints living today, they know their divinity, they know their inheritance and background, so they carry on regardless. Sai Baba now has to give darshan from a wheelchair, but that has not diminished his divinity, in my mind it has enhanced his divinity. Saint Francis of Assisi, when you think of him and the suffering he went through, that suffering was the final test, it is through that suffering he fulfilled the reason of his birth, serving God in humanity. Cynics are very quick to criticize that which they do not understand – the lives of people who are dedicated to God. Those people who criticize great saints and masters, they must be very special people, they must be better than better! Be human, not inhuman. Be who you really are, but carry with you a lot of grace and love. One of the most wonderful times I’ve had, (and you must think I am mad), has been over this last month, entertained by the nurses of Carmarthen general hospital. I had a wonderful time; I was very ill. One of the greatest things when you go to such a place is not to let your divinity to be diminished. It depends on how you go in and how you come out, how you conduct yourself. I see the funny side of every single thing they do to me, for I know Mother and I know the Lord. Everywhere people in the world are experiencing difficulties – then why should I not experience difficulties? I represent the Lord. Instead the Lord gave me instructions to identify myself with humanity. Relate to people on a day to day basis, so that they in turn can identify and relate to me and in doing so come to know God. With that mandate who can complain? Divine friends, don’t make life more than it is, there is not a human being who hasn’t got to suffer, particularly those who are the representative of Almighty God. If you know you are the Lord’s representative, you will convey that message from God to humanity. The karma that you have to pay is not someone else’s, it is your karma – until such time when you are able to take somebody else’s karma and give them grace. I remember just before I went to hospital, we had just finished the puja to Mother in the Yaga Sala, hundreds of people were present… and you may wonder what I’m doing in the sanctuary all tarted up? It’s a role, performing the duty of the Guru. I don’t do anything except what Mother has asked me to do. So I collected some vibhuti – I don’t ask questions, why? when? where? I gave the old lady vibhuti – and she was thrilled that I had given her vibhuti and blessed her. She did not realize I knew, (because Mother had told me) that it was her birthday. She was saying, “I don’t know what is going to happen to me; I feel I’m going to die soon”. I said, “Darling remember this, we all have to die”. Then immediately Mother said to me, “take your shawl and put it on her”, so I took my shawl and wrapped it around her. You’ve no idea – she was over the moon! That is what love is, that is what obedience is, giving of yourself selflessly. If I have to undergo one fraction of her problems, so be it. I have given her great joy, for very soon she is going to die. That is the purpose of your birth, to learn total obedience to God. It won’t come easy, you have to fulfill the scriptures, they are the stepping stones to the summit and union with Almighty God. For all those around me in this last month, I had a duty to perform, I had to bless and give darshan to those who were suffering. Through my own discomfort Mother found a way to go to those who were very ill and lonely and She made them feel oh so good. Divine friends, everyone has to come to know God in their own way. There is not one way! You have a limited concept of God – God is vast, vast as the oceans, high as the heavens. Even the dying man will get shakti to praise the Lord. The more you plug into divine consciousness the more you will never be alone, never, never, never. It seems a miracle to others but for you it is your nature. How nice to see you all. I have the best monks and nuns in the world because they were sent by the Lord to perform a duty and they are learning very well. From every corner of the world people are coming. I may be shut away in my room, but do you think anyone can stop me from seeing anything I want? Yes I had fun, alongside my pain I had pleasure serving the Lord I know. Guru: Yes, Mother tells me of a particular person who is a devotee of Hers. In this instance whilst the puja was going on, the old lady was telling Mother and the Lord, “I’m going to die and I’m feeling alone, I need your Grace”. So immediately Mother responded when the opportunity arose. I love humanity the same as all the saints and those involved in the universal consciousness.